February is a great month for watching raptors in Pittsburgh. Peregrine falcons are courting and bald eagles are already nesting. This week was especially full of raptor news. Here are just four of our many pairs. First things first: Peregrine falcons! Peregrines love good weather — don’t we all — so they were particularly active on Tuesday February 20, a single sunny day in the midst of snow, sleet, rain and fog. 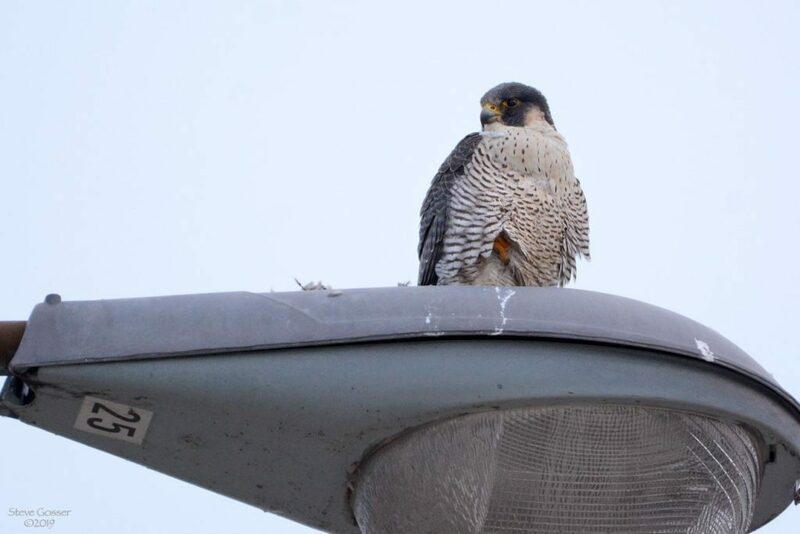 At Tarentum, Steve Gosser found the resident female peregrine perched on a lamppost. Though she isn’t banded she’s easy to recognize because her breast is very dotted. This is quite different from her mate who has an almost clear white breast and is banded Black/Green 48/BR (Westinghouse Bridge, 2014). Above, she looks regal on the lamppost. Below, Steve whistled to attract her attention and she gave him the “Who’s whistling at me! ?” look. Many of you saw this photo when I shared Steve’s post on Facebook. It’s the perfect Peregrine Attitude shot. 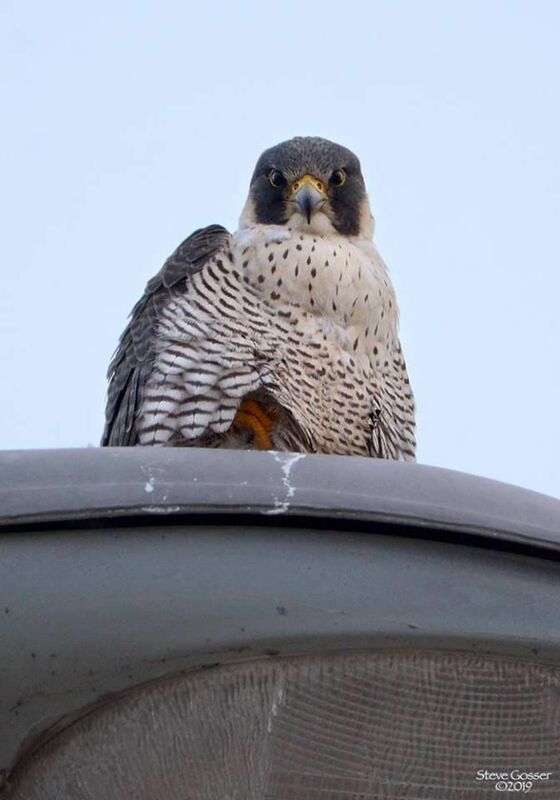 There was a lot of Peregrine Attitude at the Neville Island I-79 Bridge when Karen Lang and I stopped by on Tuesday. Minutes later the female pumped upriver to chase away an immature female peregrine. After the ladies flew out of sight, the male circled up and away as well. 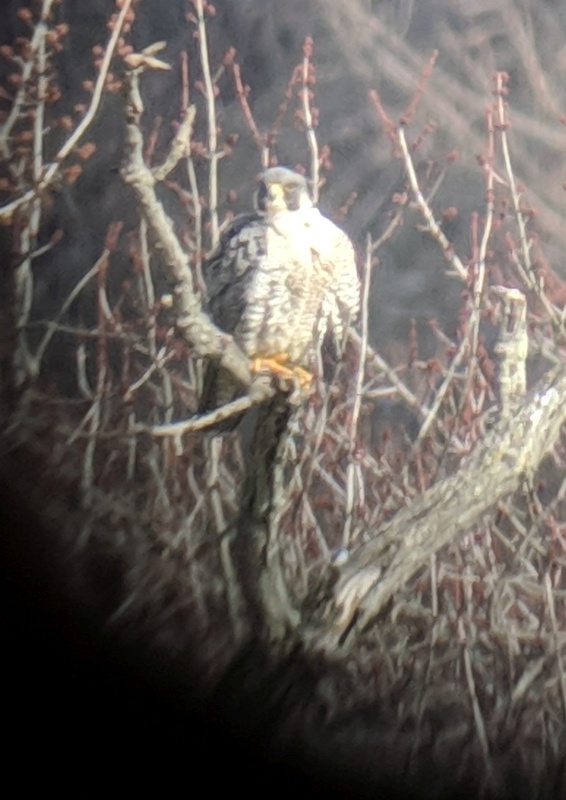 I was able to see through my scope that the male is banded Black/Green, possibly the same male as in prior years: “Beau” Black/Green 05/S (Pitt, 2010). However I couldn’t see any bands on the female, no dark spot like the Black/Red bands on Magnum, the resident female of prior years. This female deserves another look. I wonder if Magnum is gone. Courtship is underway for Hope and Terzo at the Cathedral of Learning. 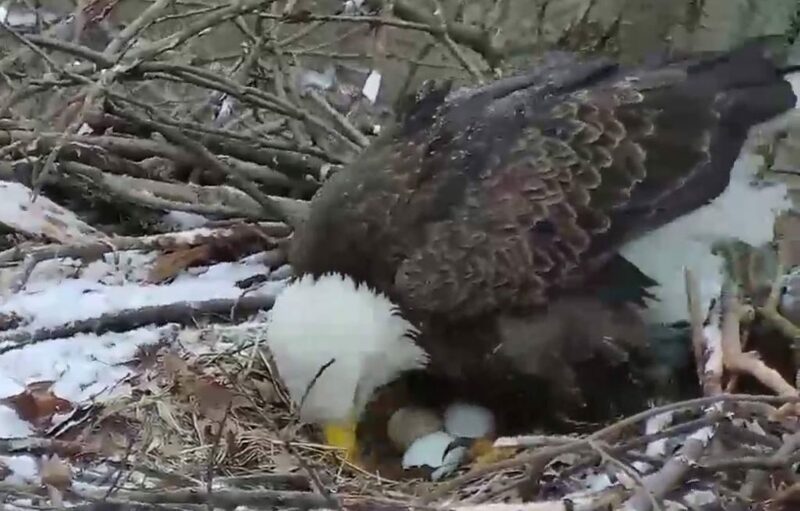 Yesterday, February 21, she called for him to bow with her at the nest. We can’t hear her but people inside the Cathedral of Learning probably did. She is one loud bird. 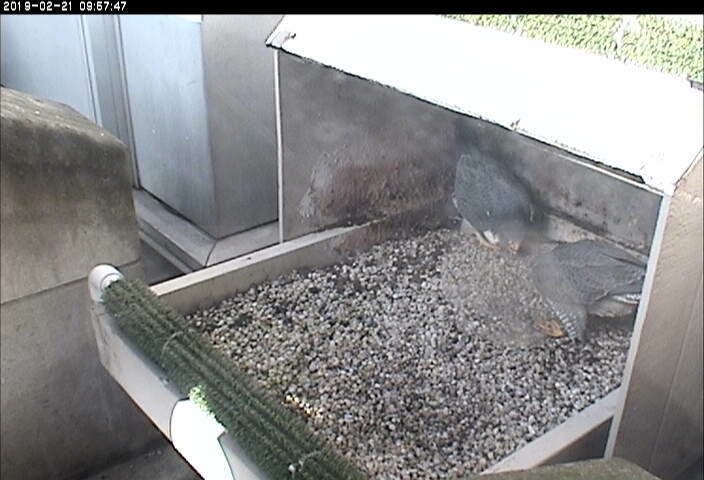 The pair bowed for less than half a minute and then they were gone. 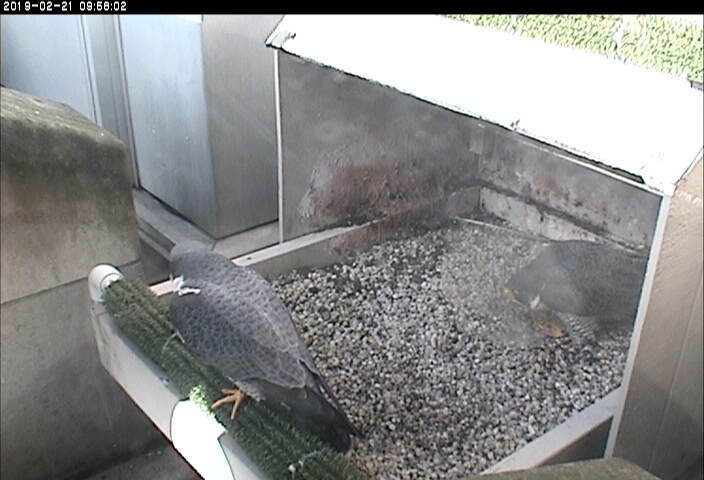 Watch the Pitt peregrines on the National Aviary Falconcam. Expect their first egg next month. It’s been a busy week for the Hays bald eagles. They’ve been on eggs since February 12. 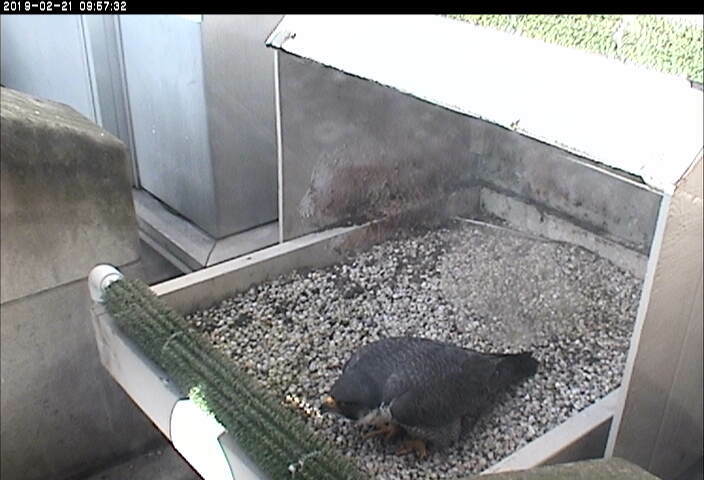 On Monday, February 18, the female laid her third egg. Then on Wednesday morning it snowed so hard that she had to give herself a good shake to get back to normal. Watch the video here. 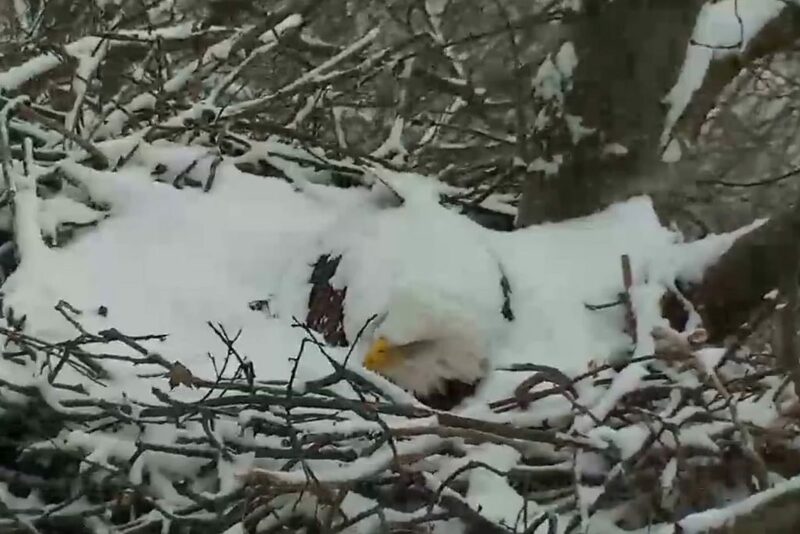 Keep up with the Hays bald eagles at the Audubon Society of Western Pennsylvania’s Hays Bald Eaglecam. why can’t the falcon cam be like the eagle cam, with rewind feature and pause feature. without this, we miss a lot . i always check your site, thanks for your info. mary t, the falconcam and eaglecam are managed by different organizations. Falconcam = National Aviary. Eaglecam = Audubon Society of Western PA with CSC. Each organization picks the hosting method that works for them: Falconcam = Ozolio, Eaglecam = YouTube. Ozolio doesn’t appear to have rewind. YouTube does. So that’s why. The last photo is cool with the eagle all embedded in the snow. It never ceases to amaze me how much more patient and persevering animals are in general versus humans. I know that there are physical reasons that the snow may not bother this eagle, the supreme quality of its feathers to insulate for instance, but still, even with feathers I think that the desire to shake that snow off my back would be overwhelming!!! Thanks for monitoring everything Kate! It is such fun to watch these early Springtime activities! Thank you for keeping us updated! One of the many fun and awesome features of spring besides better weather for some of us…I enjoy some events or happenings in winter and the snow IS beautiful but get tired of the frigid cold and ice and rain~looking forward to spring migration and visions of the raptor activities. Thanks for another delightful article, Kate. In the past few years- Schenley Farms Civic Association’s “Crow Abatement Committee” & The University of Pittsburgh – have begun to play LOUD recordings of “birds in distress”, to scare off Crows…Actual recordings of birds being devoured and torn to bits. Those recordings are documented to also ATTRACTS MORE predatory birds. Without Crows to keep the balance of Raptors in check, the balance of songbirds in the area is going to also to become unbalanced. I can no longer enjoy having a bird feeder in my own backyard without luring songbirds and even squirrels to their death, by the new abundance of birds of prey in this area. It is against the law to harass raptors (as it should be), so why is it not against the law for a few individuals to harass Crows and upset the entire balance of nature with recordings of birds in distress? The balance of nature has been tampered with by a few people. Crow droppings wash away with one good rain. Sue Hughes, Schenley Farms Civic Association can stop playing the recordings now. The crow flock is breaking up and is leaving town Feb thru March. There were 10,000 crows at Pitt in late December (I counted) so obviously the scare sounds didn’t work. The crows even roosted in the trees that had scare-speakers. The crows shrugged. They weren’t fooled. There is a way to share crows but it takes more effort than an overplayed recording.